A month after the Iditarod, the Kobuk 440 is one of the last dog sled races of the season. The village of Ambler, 45 miles north of the Arctic Circle, is the main checkpoint. Mushers come through Ambler both on the way out and on the way back in, and it’s where they take their longest breaks. Volunteers from the community pitch in to run the checkpoint. According to some, most of the village’s 260 residents help out. This month on Story49, hear from a few of a them and listen in as the Kobuk comes to town. Handmade signs welcoming mushers and Easter baskets for local kids brighten the community hall that serves as headquarters for the Ambler checkpoint during the Kobuk 440. Photo: Zoe Grueskin, KNOM. Hand-painted signs to guide mushers into Ambler. Photo: Zoe Grueskin, KNOM. Volunteers from Ambler cut and haul ice from the Kobuk River and keep fires burning overnight to provide hot water for mushers. Photo: Zoe Grueskin, KNOM. Ambler residents look on as Nicolas Petit gets his dogs settled at the checkpoint. Photo: Zoe Grueskin, KNOM. If you or someone you know has a story to share, contact KNOM at (907) 443-5221 or through our contact form. Story49: Sharing your voice, your story, your Alaska. 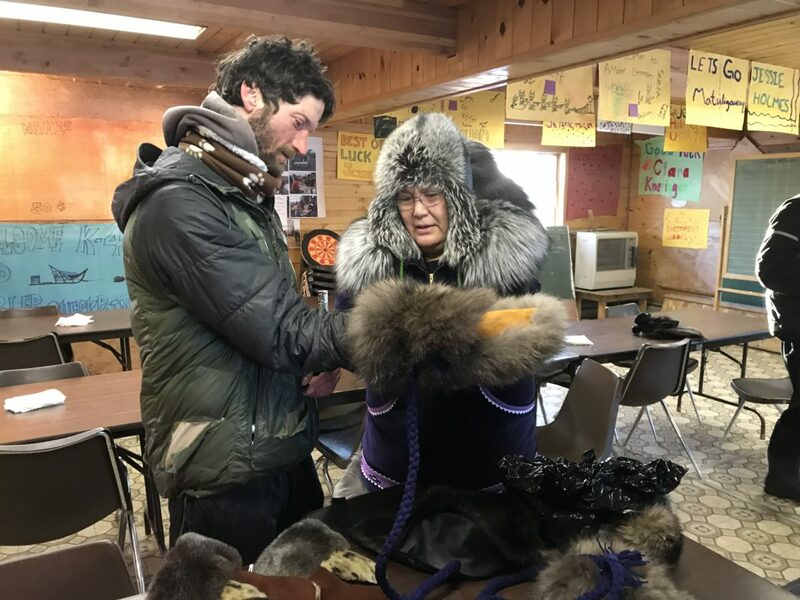 Image at top: Myra Yupikson (right) shows Kobuk 440 champion Nicolas Petit the fur goods she sewed for the mushers. Photo: Zoe Grueskin, KNOM.